These are the nail remover wipes which are supposed to remove even the last traces of nail polish on your nails. These wipes are infused with vitamin E and olive oil. Thus, while removing the nail paints your nails will remain soft. For all the nail paint junkies like me who love to apply nail paints regularly. These wipes are extremely handy and you can apply them even when you are on a go. These nail polish wipes are supposed to remove the nail polish from your hands in a maximum of two swipes. These are also supposed to keep your nail cuticles soft and shiny with vitamin E and olive oil. This will also help in further healthy growth of your nails. The comes in small and extremely cute packaging. 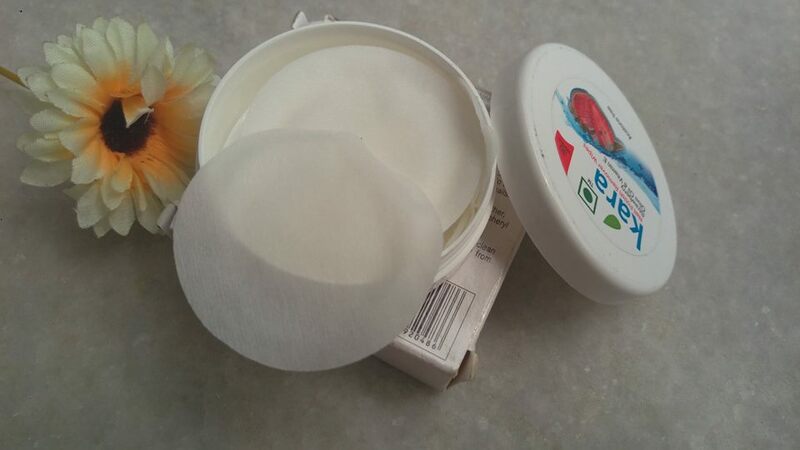 It is a small and pocket-sized jar which contains the pads. You need to twist the jar’s cap so that you can access the pads. The jar has enough product description all over it which users can read. I love the jar for the packaging as this is extremely light and very less space consuming for travel time. So, a huge thumbs up in that department. 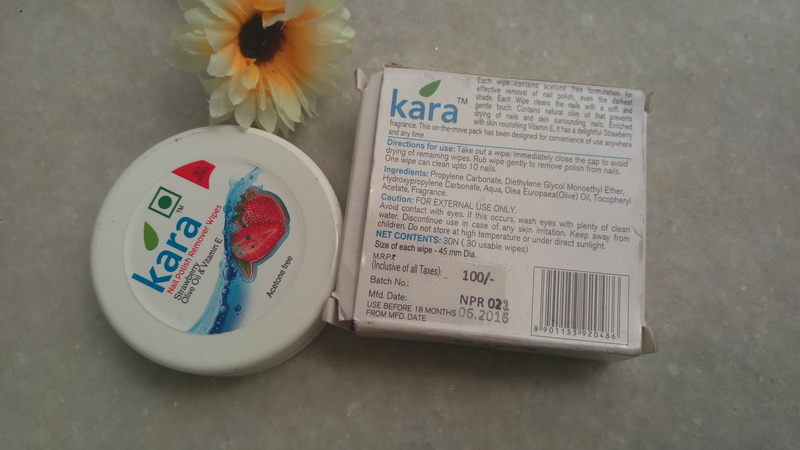 Kara Nail Polish Remover wipes smell heavily of olive oil. It is a strawberry infused flavor and thus as soon as you open the cap you will get the smell of olive oil and very light strawberry. For people who don’t like the strawberry smell, this is not a good choice. This is the best part of these wipes. They are heavily coated with olive oil. As soon as you touch them, you can understand that they have oil dripping through them. Also, when you use this wipes your nails are also heavily moisturized and overall they leave a soft impression on your nails which is praiseworthy. Olive oil and vitamin E are the primary ingredients of these nail polish remover wipes. They also contain chemicals and added fragrance. Is it safe for skin? Overall, it’s safe. But if any of you are allergic to olive oil, then these wipes are not for you. Also, if you face any kind of skin irritation or discomfort then immediately stop using these wipes. You require only 1 to maximum 2 wipes to remove nail paint from all your 20 fingernails. If you have applied nail paint where both of them are of dark color, then you might need 3-4. But that’s all. Finally, you will get nails which are extremely soft and coated with the goodness of olive oil which is really great and highly recommended for regular nail polish users like me. If you are a frequent nail polish user, then your nails will turn dry and colorless. But with these wipes, it will be taken care of. These wipes are travel-friendly and easy to use. Make sure that you tightly enclose the cap of these wipes. Otherwise, the effectiveness of these wipes will go away. The bottom line: I am in love with them. Now, I have completely substituted my nail polish liquid remover with these wipes. I am going to re-purchase them in different variants. For me, they are economical too.